Anti-abortion extremists have taken to protesting outside the home of Julie Burkhart, the CEO and founder of the Trust Women Foundation and the Executive Director of the South Wind Women’s Center. 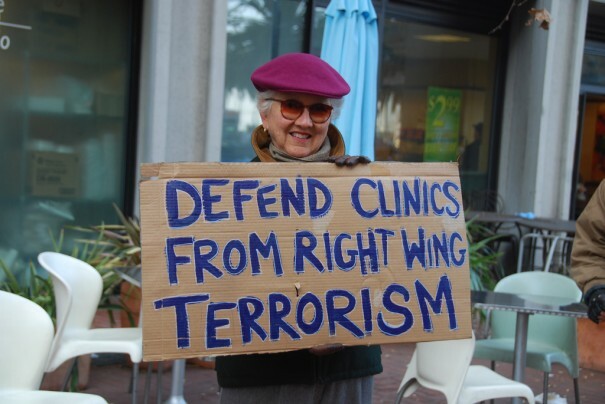 In the wake of the 42nd anniversary of Supreme Court decision Roe v. Wade, extremists have begun targeting the ED of the Wichita, Kansas clinic – which is located in the same building as the late Dr. Tiller’s practice. Yesterday, the quiet of Sunday afternoon was disturbed outside Burkhart’s home by extremists holding signs such as “Prepare to Meet Thy God” meant to intimidate Burkhart. Another sign read “Fear Him Who Has the Power to Cast You into Hell,” and yet another said “Where is Your Church?” Dr. Tiller was murdered in the lobby of his church. Burkart and the South Wind Women’s Center are not the only ones being targeted. In fact, the Feminist Majority Foundation’s National Clinic Violence Survey has shown that since 2010, the distribution of old west-style WANTED posters and pamphlets targeting doctors and clinic staff, and featuring doctors’ and staffs’ photographs, home addresses, and other personal information, have almost doubled from 27% to 52%. Furthermore, the survey shows that clinics impacted by the most serious anti-abortion threats increased from 26.6% of clinics in 2010 to 51.9% of clinics in 2014. Historically, these kinds of threats to abortion doctors, staff, and clinics have often preceded serious crimes such as violence, arson, bombings, stalking of clinic staff, patients, and doctors, and murder. “Given this history, the dramatic increase in extremist threats cannot be ignored,” said Eleanor Smeal, President of the Feminist Majority Foundation. Take Action: Donate to our National Clinic Access Project today and help us keep clinics open!